Having work done to your academy school roof can be a bit daunting, and we’re committed to demystifying the experience. This summer we’re refurbishing several school roofs and are delighted that the Business Manager of one of the schools has agreed to let us document the process for you. Read our posts in the coming weeks to find out what happens as we replace several roofs on this Academy in West Yorkshire. The school we’re going to be writing about over the next few weeks is a large Secondary Academy with approximately 1400 students. The school is part of a Multi Academy Trust and prides itself on providing a good all round education for its students, nurturing them to grow into valuable individuals in the community. We’re not naming the school to protect its confidentiality, but read on – you’ll no doubt find many familiar features of this school’s situation which chime with your own. Parts of the building date back to the 1950s and 60s and in recent years a new extension was built onto the front. Almost the entire site is covered with a mixture of single storey and multi storey buildings, most of which have flat roofs. 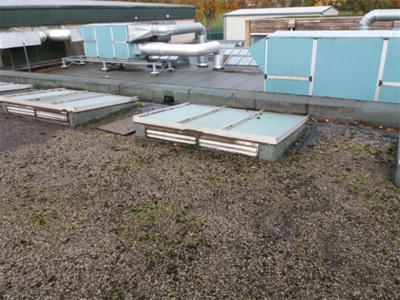 For many years, the school has suffered from leaking roofs, and the school business manager had made previous bids for funding from the Education Funding Agency’s Condition Improvement Fund (CIF). Unfortunately due to poor advice, none of these earlier applications were successful, for a number of interconnected reasons to do with how the applications were made. 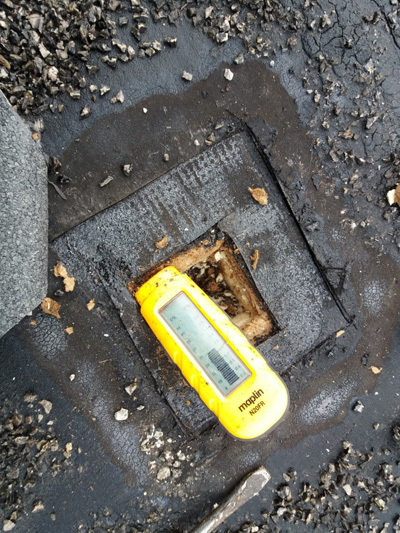 The Academy Business Manager contacted our specialist surveying partner Arcadis, a national firm with a specialism in public buildings, and through Arcadis were put in touch with SIG Design and Technology, to see if we could assist in getting funding for the essential roof repairs. We arranged a visit and met with the Academy Head and Business Manager, and then carried out a full detailed survey and inspection of the school and its roofs. Like many schools in the UK, this academy consists of a multitude of interconnected buildings which have grown up over the years as the school has grown and its needs have changed. Most of the roofs are flat with all different designs and build ups. This can be very confusing to the untrained eye, particularly if as a school business manager, you don’t have a record of the full history of the site and buildings. To be able to assess the situation needs some experience and technical skill to determine the age and current condition of the fabric. Over the course of a day we surveyed and graded all the roofs, which totalled 11 in number. Some of them had metal decks on which the roof was built up, some were timber. Some of the roofs have no insulation at all, which will contribute to significant heat loss in winter months, along with a risk of condensation issues. Some of the roofs are covered with heating plant which needs maintenance access, and the waterproofing covering ran the whole gamut from old bituminous finishes covered with chippings, to single ply membranes and liquid waterproofing. Some of the roof coverings had been repaired or over-covered with new membranes, but several of these have also now reached their “end of life”. With many different buildings having built up over time, drainage of water was a key factor. 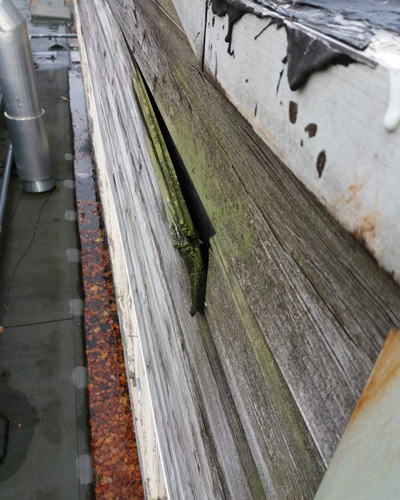 Many of the gutters between roofs are reaching the end of their serviceable life, and some had been repaired at various times with emergency paint-on products as a short-term fix. A gutter above the dining hall is leaking, damaging floors and causing slip and trip hazards. The leaks were worst of all in the multi-purpose hall which has a gutter over a large beam which is leaking. This space is used for a dining hall and water was entering the building right above where the students eat, tracking along the beam and dripping onto the floor, damaging the timber flooring and being collected in buckets, which of course form a trip hazard as well as a health hazard. Some of the roofs we inspected had old glass roof lights fitted with Georgian wired glass. These are very fragile and represent a significant risk to anyone working on the roof. They will be replaced with new triple skinned roof domes which have been tested for safety, so that even if someone fell onto them they would not fall through. Around the roof areas there are various types of upstands and timber cladding, some of which are damaged or aged and will be renewed with composite panels which have a long life and need no significant maintenance. There are also some lead parapet outlets, and around the hall roof a set of high level windows will also be replaced. In this way the life of the new roofs will not be affected by any deterioration in the surrounding fabric. test for moisture in the roof, identifying both leaks and potential interstitial condensation (where moisture vapour condenses inside the roof fabric, leaking back into the building). In the two classrooms and the hall, buckets are being used to catch the water leaking through the roof. All these areas are of course essential to keep dry, including the boiler house which contains a new boiler that is at risk of being damaged by the failed roof above it. Arcadis’ role on the project will be project management, cost management, building surveying and CDM (Health and Safety) advisors. SIG Design & Technology provide the design and detailed specification, assist in the selection of an accredited contractor, supply the materials, monitor the installation and provide guarantees and maintenance advice. We’ll be blogging about the works over the summer to give you an idea of what it is like to have this sort of work done. The next post will cover the process of setting up the site in preparation for the works, including considerations of health and safety. If you’re in a similar situation at your school, why not tell us about it in the comments, and feel free to ask us any questions too.